West Highland Terriers have a small, balanced and tough frame covered in a 2-inch white coat. Their round heads are slightly longer than their muzzles. They have dark noses and almond-shaped, widely set eyes that—along with their small pointy ears—have an alert expression. Their muscular necks and sloping shoulders lead to a deep chest. Their short, carrot-shaped tails are carried high. Overall, West Highland Terriers have a warm and soft look that embodies strength and activity. They may look cute and cuddly, but West Highland Terriers would much rather be running around than sitting on a couch. 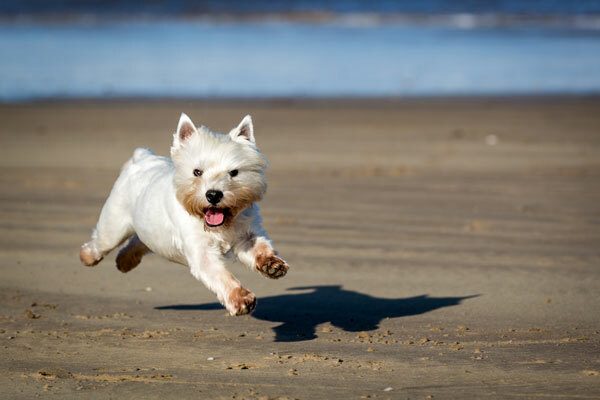 Bursting with energy, curiosity and playfulness, Westies are always game for activity. This can involve playing games inside or out, chasing small animals or digging—or all of them at the same time! Though high-energy dogs, West Highland Terriers don’t require too many walks or jogs to stay mentally and physically healthy. West Highland Terriers are loyal and devoted pets—a great family dog for city or country living. They get along with children who are old enough to respect their space, and they are very friendly with strangers. However, they can be quite effective guard dogs, barking wholeheartedly if they sense danger. These dogs have a self-confidence and self-reliance that can be good (resulting in resourceful play and solid companionship) or bad (resulting in destructiveness). Though independent, Westies need attention and activity or they can become restless. Left alone for too long, they could dig up a garden, chew things or get involved in other forms of mischief. West Highland Terriers, descending from a breed of robust dogs that chased rats and foxes through the moors, are naturally curious and intelligent. Always keep them fenced-in or on a leash. If they see a small critter scurrying off somewhere, they will most likely follow them at lightning speed. Not only do West Highland Terriers bark when a suspicious person approaches the house, they also bark when just about anyone pops by. With proper training and socialization, this barking can be minimized. Westies are relatively clean and odorless, but they still need daily brushing to keep their coat under control. A healthy West Highland Terrier can live as long as 14 years. Common health problems include joint deterioration and skin allergies. West Highland Terriers—legend has it—were bred from the white offspring of Cairn and Scottish Terriers in order to create a hunting terrier that would not be mistaken for a fox. They debuted at a London dog show in 1907 and were registered by the AKC in 1908. Originally registered as Roseneath Terriers, their name was changed to the West Highland White in 1909. Over the years, they have become increasingly popular due to their talents as both hunting dogs and companions.